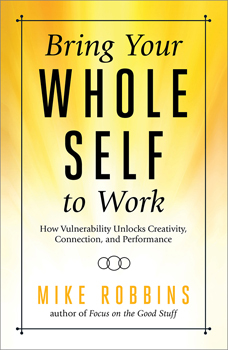 In his latest release, speaker and consultant Mike Robbins sets his focus specifically on work. Unlike his previous books, Bring Your Whole Self to Work is written directly in the context of professional and organizational development. In it, he concentrates on the most important elements of his work: authenticity, vulnerability, appreciation, taking risks, and building strong relationships and teams. Mike draws from more than 15 years of researching, writing, and speaking about human experiences in the workplace. His clients have ranged from Google to Citibank, from the U.S. Department of Labor to the San Francisco Giants. From small start-ups in Silicon Valley to family-owned businesses in the Midwest. From what he's seen over the years, Mike believes that for us to thrive professionally, we must be willing to bring our whole selves to the work that we do. And for the groups, teams, and organizations that we're a part of to truly succeed, it's essential to create an environment where people feel safe enough to bring all of who they are to work.